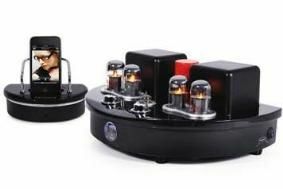 Fatman releases iTube high-end valve amps with bundled iPod docks | What Hi-Fi? The FatDock enables wireless streaming from an iPod or iPhone to the amp, while the latter can of course also be used as part of a standard hi-fi system. The 302's Class AB Push Pull design releases 30 watts per channel, while the Class A Single Ended 202 (pictured) fires 20 watts per speaker. Round the back of the FatDock you'll find a 3.5mm input and a USB output, alongside the standard Apple docking connection, while a receiver, for connecting to your amp, and a remote are included, too. The iTubes themselves have three pairs of RCA inputs, another 3.5mm input and a subwoofer out connection. The Fatman iTube 202 and iTube 302 go on sale in the UK and Europe from April 2010 and will have suggested retail prices of £899 and £1149 respectively. The above prices include the FatDock and a three year warranty.